Last Update: 2019-02-02 - Major Update: Improves the efficiency of compressing GIF animations with a large number of frame images, making the waiting time less. 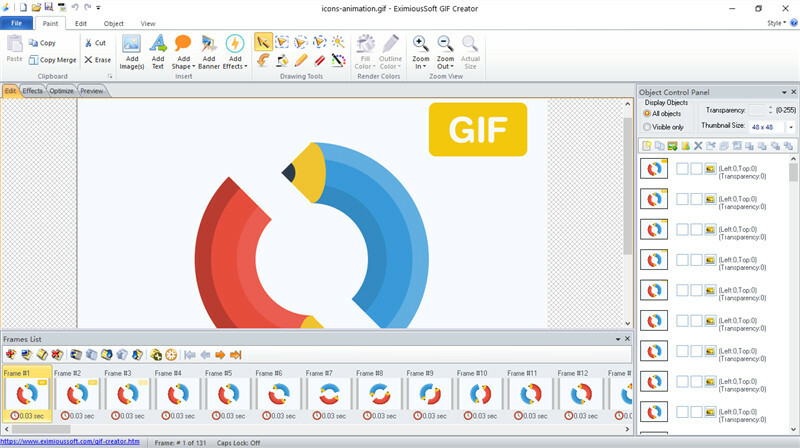 EximiousSoft GIF Creator allows you to freely add images, text and various vector graphics. The program comes with a library of vector symbol graphics with over 5000+ quality. Some of them can be selected to be inserted into the animated picture according to actual needs. GIF Creator also allows you to add shadows, borders, transparency and set filter effects to each drawing object. In addition to vector graphics and text, GIF Creator also allows you to set a gradient or a solid color to fill or stroke. What's more, you can view the edit results directly as well as cancel any operation at any time.